Watching Art Party brought back memories of my own art master at Bexley & Erith Technical High School, now rebranded as BETHS Grammar School (skip ahead a couple of paragraphs if you aren’t interested in this personal digression!). To me, Mr Wilson was one of the most inspiring teachers, not just because of his obvious enthusiasm about visual art but because of the way he dealt with his disability. At some point in his life Mr Wilson had lost an arm. He didn’t talk about it and I never knew what had happened, but the story that had filtered down to us (true or false, I don’t know) was that Mr Wilson had lost his preferred arm and subsequently taught himself to draw and paint with his remaining arm. But to my young self, who had never encountered any form of disability (other than a neighbour with a glass eye), what most struck me was the matter-of-fact way Mr Wilson behaved in regard to his bad arm. He never tried to hide the stump. On the contrary, he would walk confidently around the classroom in short-sleeved shirts with the stump protruding, including a stringy flap of skin that hung down. When he was demonstrating aspects of painting or sketching to us he would tuck brushes, palettes, or drawing pads under that stump. Back then, in the 1970s, this struck me as quite bold and I think it seemed to represent the idea that art and artists have a freedom that isn’t apparent in other areas of life. Mr Wilson didn’t just teach, but he would also produce his own art. There was one year when structural problems at the school forced us to temporarily decamp to a recently-vacated convent. In the hall of this building Mr Wilson undertook a large mural depicting some sort of battle scene (as I dimly recall, it was a middle ages kind of thing, with swords and suits of armour). Once we had relocated back to the proper school buildings I used to walk past the convent, which was in my home town, and still see the mural through the window. Until now, I hadn’t really stopped to appreciate the incongruity of having a battle scene on a convent wall. I like to think that the picture hadn’t been commissioned by the headmaster and that Mr Wilson was driven by his own inner inspiration. Although I didn’t end up pursuing an artistic career, several years ago I took up photography and didn’t need to be taught the rule-of-thirds because I remembered this from my school art class. All of which brings me to Art Party, a film made in response to the apparent downgrading of arts within schools by UK Education Secretary Michael Gove. In 2011 the artist Bob and Roberta Smith (real name: Patrick Brill) wrote an impassioned letter to Gove about the importance of arts in schools. This was followed, in 2013, by a large gathering of artists at Scarborough for an “art party”, described in The Guardian by Adrian Searle as “a continuation not just of Brill’s campaign, but of Bob & Roberta’s art. Everyone became unwitting accomplices. With its seminars and performances, films, lectures and comedy acts, stands, podium speeches and fringe meetings, the conference was at once the real thing and masquerade, serious and silly, amateurish and passionate. It was also part-exhibition, part cringingly bad craft fayre, part gig and am-dram talent night, part immersive installation”. The Art Party film is partly a documentary account of the Scarborough event, including Bob & Roberta Smith reading out his letter to Gove, performances from musicians, and interviews with various participants about the value of art in schools and in society generally. 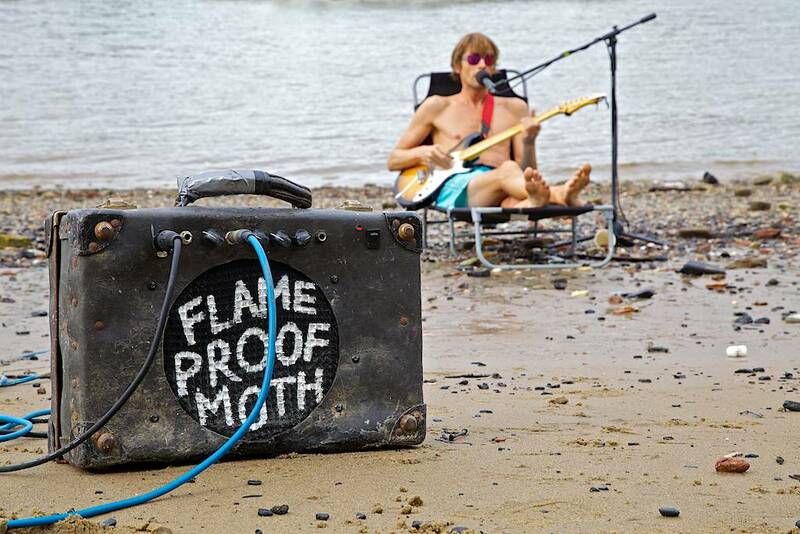 There are several performances from one of my favourites, Flameproof Moth, a busker who can often be seen playing artfully ramshackle songs on the beach at London’s Bankside, even as the tide comes in and the waves start lapping around his legs. This is all interspersed with fantasy segments involving a fictionalised version of the then Education Secretary, “Michael Grove” (played by John Voce), and his entirely fictional aid Hettie Nettleship (Julia Raynor). In truth, these scenes were a bit hit-or-miss, and the resolution of the Grove story wasn’t entirely coherent. During the Scarborough event there is a kind of redemption for Grove, as he suddenly sees the light and joins in the party. However, having struck this note of optimism, the writers then serve up a rather mean-spirited ending for Grove that seems to fly in the face, not just of his change of heart, but of the positive advice sung by Flameproof Moth (to Nettie) only moments earlier to “Reach for your best available thoughts”. Given that Michael Gove himself is also no longer the Education Secretary, having a fictionalised version of him in the film does make it already seem somewhat dated. According to the final credits, several politicians – including Gove – were “unavailable” to take part in the film. This means that Art Party ends up being a rather one-sided affair, a piece of agitprop for art rather than a wider exploration of educational values. However, the spirited contributions by the various artists, in both interviews and performances, are by themselves pretty convincing arguments for the cause they wish to support. Note: Just prior to seeing Art Party I discovered that I work at the same institution as one of the writer-directors. In addition, several students contributed to the film. As that might be construed as a conflict of interest I haven’t rated this film.